If Mary was with this group of apostles, she no doubt saw her resurrected son ascend. As a mother, I’m sure she longed to hold Him and touch Him. Maybe she held on for a long time like Mary Magdalene. She had watched Jesus die a torturous death; she had seen Him resurrected, but she had to say goodbye again as she strained to watch Him float up into the heavens. I wonder if she felt sad that day. If she did feel empty and sad, it would not be for long because God would grant her a gift even better than the conception of the Christ-child within her womb. Truly generations would call her blessed, “makarios,” for Mary N. would soon receive the Holy Spirit with the others. Our dear Mary was filled with the Holy Spirit of her son. She would carry His Presence within her for the rest of her life. Hallelujah! 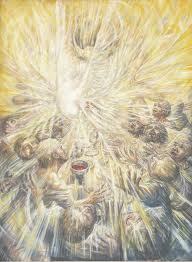 I believe it was essential for her to be with the disciples the day of Pentecost. This is why Jesus made the provision He made as He was dying on the cross. Our God does not miss one desire of our hearts. He is always faithful and gives to us beyond our wildest dreams. Mary N. would never be separated from her son again. As we walk with the Lord facing challenges and faith-snatching circumstances, let’s sit quietly in His Presence and visualize the Holy Spirit filling our souls with Him. Rather than petitioning for a miracle, let’s listen quietly for His voice and realize that the greatest of miracles has already occurred. He is with us and inside of us. It is more than we can understand, but it is reality for those who believe. More than a Temporary "Fix"